A 2.5% surcharge applies to Amex cards. Rates are based on two people in the Studio and One-Bedroom apartments and four people in the Two Bedroom apartments. Extra guests will incur an additional fee of $35 per night in existing bedding. Cancellations must be advised 72 hours prior to arrival, if you are unable to give us this notice time you will be charged the first nights accommodation or 50% of your deposit, whichever is greater. Cancellations not giving at least 24 hours notice will be charged for the full term of their booking. First night of booking will be charged to the credit card at the time of booking. All after-hours arrivals will be charged for the first night before after-hours access details are given. Portacots are available on request and charged at $15 per night. Rollaway beds are available on request and charged at $35 per night. One child under 2 years is charged extra per person per night in a child's cot/crib. If no cancellation has been made and you fail to show up at the property, we will charge full amount. 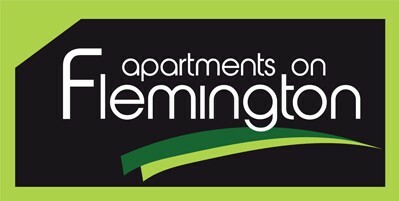 PLEASE NOTE APARTMENTS ON FLEMINGTON HAS THREE LEVELS AND NO ELEVATOR. NO RESERVATIONS ARE TAKEN FOR SPECIFIC FLOORS AS ROOMS ARE ALLOCATED ON DAY OF ARRIVAL. Limited on-site parking available but not guaranteed until day of arrival. Parking is an additional $10 per night. When car park is full you may be asked to leave your car key at Reception. On-site parking will not be available to anyone not wanting to leave their key. Street parking in accordance with local Council parking restrictions is available if needed. Our housekeeping team will service your room weekly during your stay if your stay is more than seven (7) days. Rubbish is remove daily Mon-Fri and towels are replaced Mon, Wed, Fri. If additional housekeeping services are required during your stay, these can be arranged through Reception for a fee.